In reading about European synagogues, I was struck by the wonderful decoration of these fine old buildings. 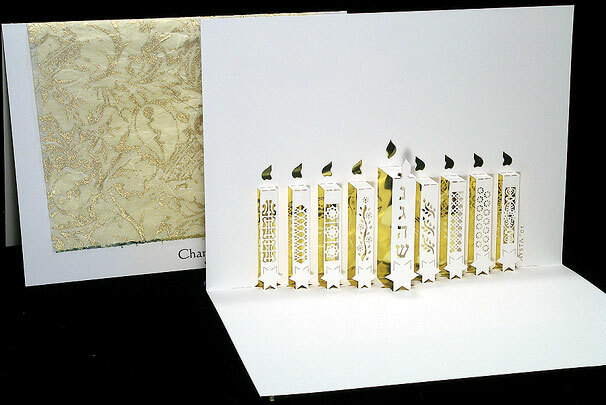 Each candle represents a decorative motif from a different synagogue. From left to right the synagogues are, Scoula Levantina in Venice, Florence Synagogue, Neolog in Szeged, Hungary, Subotica in Serbia, Subotica again, Gyor in Hungary, Kojetin in the Czech Republic, and St. Polten in Austria. Text reads "Nais Godol Hoyoh Shom (A Great Miracle Happened There)".